What is that big, orange thing, anyway? Mark di Suvero (American, b. China, 1933), The Calling, 1981-82. Painted steel. Height: 40 ft. Bluff Park, Milwaukee, Milwaukee County, Wisconsin, Gift of Anonymous Donor through Milwaukee Art Museum M1981.305. © Mark di Suvero; Courtesy of Spacetime C.C. Photo by Mel Buchanan. 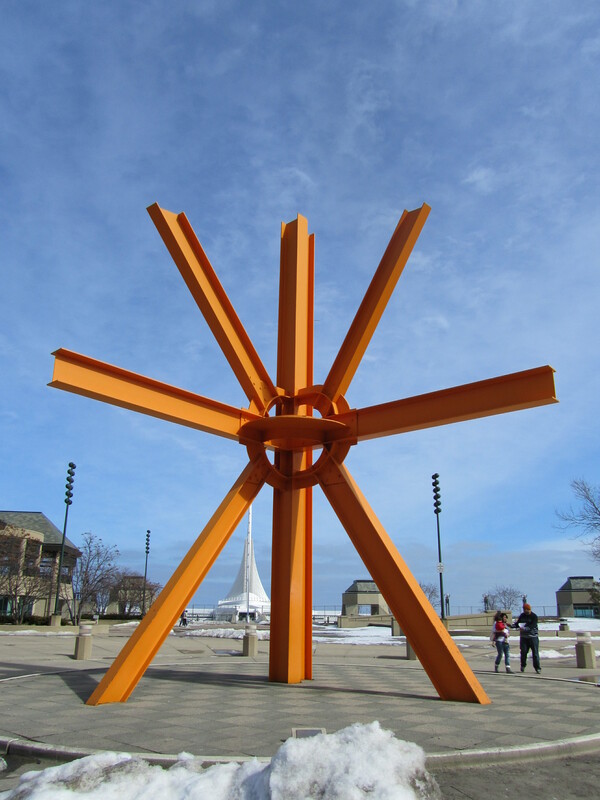 Many people don’t know that The Calling by Mark di Suvero (the orange sunburst sculpture that sits at the lake end of Wisconsin Avenue) has been part of the Milwaukee Art Museum’s permanent collection since the sculpture’s creation in 1981. The Calling has attracted a lot of attention and inspired quite a bit of dialogue by Milwaukeeans over the years, including here in an 2006 article that answers the question “Will they Move the Orange Sculpture”. I’ve found that people either love it or they hate it, as summarized in this 2007 Milwaukee Journal-Sentinel article. Recently the United States government indicated on which side of that line they stand: they awarded artist Mark di Suvero the National Medal for the Arts. You can read more about the awards at the National Endowment for the Arts website. Mark di Suvero (American, b. China, 1933) The Calling, 1981-82 painted steel. Height: 40 ft. Bluff Park, Milwaukee, Milwaukee County, Wisconsin, Gift of Anonymous Donor through Milwaukee Art Museum M1981.305. © Mark di Suvero; Courtesy of Spacetime C.C. Janet Gourley is the Education and Programs Department Administrator at the Milwaukee Art Museum. Her workday is spent facilitating programs, maintaining department attendance statistics, and knowing how to answer any and all questions about the Museum’s educational programs. Janet is the Education and Public Programs Department Administrator at Milwaukee Art Museum. Her workday is spent facilitating programs, maintaining department attendance statistics, and knowing how to answer any and all questions about MAM's Education and Programs. 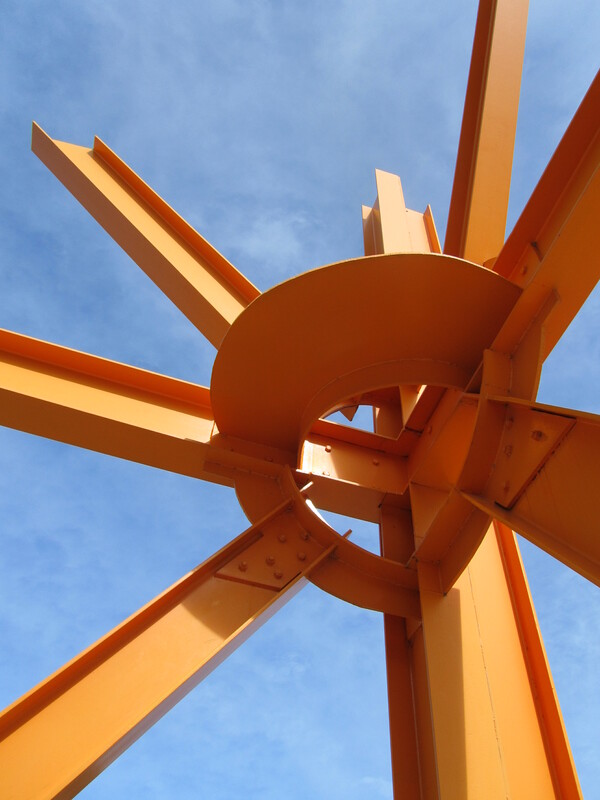 This entry was posted in Art and tagged 20th century art, Mark di Suvero, Milwaukee, sculpture. Bookmark the permalink. 2 Responses to What is that big, orange thing, anyway? I am from Milwaukee and ran the lake parks including passing the statue everyday. It reminded me of the sunrise over the lake, new day, new hope; I love it.